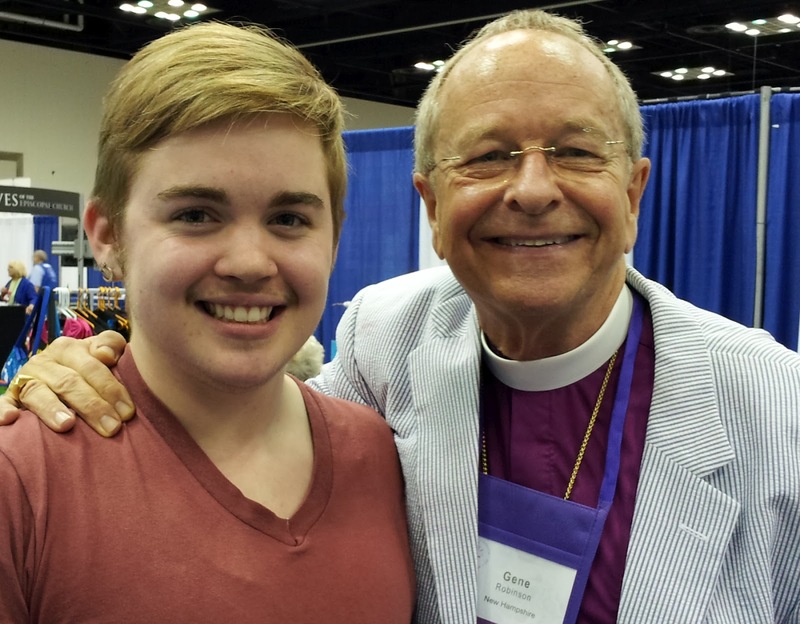 As a non-Episcopalian and a young queer trans activist, I was a little bit apprehensive about attending the 77th Episcopal General Convention. I agreed to travel to Indianapolis from my home in Western Massachusetts to help my friend and employer navigate accessibility at the Convention as her aide. She is an out lesbian Episcopalian, and a proud member of IntegrityUSA and the Episcopal Women's Caucus, and I knew how important it was to her to be able to attend. If summoning the resolve to jump into two weeks at my first General Convention would make her participation possible, I knew that my call to service was clear. Nonetheless, I was concerned. Would there be room for someone like me at the General Convention? I'm a queer, genderqueer trans man and at home, I use art and performance to speak about intersectional justice as loudly as I can manage. I was also raised in a deeply Christian family, and continue to seek Jesus' message of teaching, preaching, and healing while working to hold my certainty that God loves me just as Ze loves the whole benevolent universal creation. It is rare that I am able to live fully in both my transformative faith and my social justice politics. As I boarded the flight to Indiana and checked into the hotel, I worried that I would need to once again perform a less-than-whole version of myself to make it though the Convention. I shouldn't have been concerned. My employer volun-told me to help TransEpiscopal with their work at the Convention, and the generosity, warmth, humor, and heart of the group of people here has been astounding. I feel grateful for their willingness to include me in their initiatives to pass resolutions D002, D019, and D022, and their larger mission of promoting visibility, inclusion, and understanding of trans people and our lives in the church. Our numbers are small compared to the massive scale of the event, but our spirit is disproportionately strong, propelled by the compelling message that we bring about the future of The Episcopal Church. In the last several days I have had the chance to speak with people as they stop by the booth, encourage them to check out our materials, and engage in friendly dialogue while clarifying the urgency of TransEpiscopal's mission. As folks stop by who have little experience with transgender politics or experiences, I am moved by the number of people who express great willingness to make connections and learn, making it safe and feasible for me to have these vulnerable interactions. As our conversations develop, many people share stories with me about trans people they notice in their lives. I noticed one man momentarily lingering near the table, and we made small talk about General Convention. He eventually spoke of a trans woman he works with who transitioned on the job, impressing upon me that he respects and values her because she's a good coworker. I brought up the widespread employment discrimination faced by many trans people, and we talked about supporting a trans coworker as an important way to support gender justice. Another woman stopped by hoping to talk about ways to support her friend, a mother struggling to accept her trans son who has come out in the last year. She spoke earnestly about not understanding much about transgender identities, but feeling strongly that she must find tangible resources and language to pass along to her beloved friend. I spoke to her from my own experience of patiently working with my mother as she struggled to accept my transition, and Donna Cartwright, one of the co-founders of TransEpiscopal, also shared from her experience with her mother. We directed her to resources for parents of trans children, and also spoke about the power of love to transform some families' acceptance over time, and God's unwavering love for each person in the family as they work to grieve, process, and witness each others' true selves. Each interaction like these demonstrates the depth of the power of courageous love to conquer oppressive fear. The power of telling the truth of my trans lived experience to another person is a prophetic ministry of hope and the possibility for interpersonal triumph over the superhuman monolith of prejudicial discrimination. I'm reminded of the young David on the verge of battling the biggest, baddest guy that the Philistines could find, as described in 1 Samuel 17. Goliath, like the giants of exclusion, discrimination, and prejudice that we stand down every day, wasn't operating on a human scale. He's between eight and twelve feet tall depending on who's telling the story, his armor is between 60 and 120 tons, and his weaponry is ultra high-tech for the ancient world. The Israelites, with all their war weapons and violent fervor, are afraid to challenge him. Even King Saul, himself a tall and powerful warrior with ancient high-tech armor, isn't interested in taking his chances with Goliath. To make things worse, Goliath is vocal about his intention to destroy the Israelites, raining down all sorts of shady comments and threats and challenging them to fight every morning and evening when they're trying to worship and pray. At this time, David is the little brother of three older soldier sons, so he's at home in the mountains tending the sheep when his dad asks him to bring some provisions to King Saul's men. When David hears about Goliath and all his threats, he goes to Saul to volunteer to face the giant – to speak truth to power. Perhaps in an effort to save face, “Saul said to David, Thou art not able to go against this Philistine to fight with him: for thou art but a youth, and he a man of war from his youth” (1 Samuel 17:33). David elaborates that as a shepherd, he's used to dealing with large, loud, aggressive threats to his flock – he killed a lion and a bear by himself, evidently using just his courage, faith, and desire to protect his sheep. Saul piles all his armor onto David's small frame, but David refuses it, saying he hasn't tested Saul's equipment and trusts his usual weapon, the totally low-tech slingshot. When David shows up to face Goliath, the monolith starts up again with the discriminatory diatribes. Goliath is offended that the Israelites have sent a young person to take him on – Goliath, like Saul, estimates that young people aren't any good at speaking truth to power. David lays it on him, saying “Thou comest to me with a sword, and with a spear, and with a shield: but I come to thee in the name of the Lord...and all this assembly shall know that the Lord saveth not with sword and spear: for the battle is the Lord's, and he will give you into our hands” (1 Samuel 17:45-47). To seal the deal, David whips a smooth river stone from his slingshot into Goliath's forehead, the big guy topples over, completely defeated. David makes an important distinction about what brought him to victory. As the spiritual inspired by 2 Corinthians 20:15 says, “The battle is not yours – it's the Lord's.” David's stature, weaponry, and ammunition are small, but he knows he's contributing to the tidal force of God's justice reflected in courageous incarnational presence by human beings. When it comes to our work toward full transgender inclusion in The Episcopal Church and in the world, we commit small acts of courage that contribute to the larger change of transgender people assuming their rightful place as spiritual leaders and valued members of parishes and dioceses. Every moment in which I trust God enough to have an honest conversation with a stranger about being a transgender person, I lean on the sustaining faith that brought me to that moment with a fellow human being, a seeker like myself. Every time I bear witness to the incredible and mischievous grace of the Universe that made me fluid and resilient, I am like David, quietly kneeling by the river to find the smoothest stones, worn down to the authentic truth by time in the flow of the life-giving waters. Every connection that I share with another person about the lessons of life in my body is another stone lodged in the forehead of institutional discrimination until that bellowing giant is inevitably felled. Some deliver dire predictions that voices and bodies like ours will bring chaos and collapse to the church, just as fearful and prejudiced people around the world assert that we are irreparably unraveling the social fabric itself. As a trans person, I have the lived experience of immersing myself in the chaotic unknown – throwing myself into the abyss of change through transition with complete doubt, but also with complete trust that God's omniscience regarding my truest self will uplift me from my dark nights of the soul into the morning light of my glorious future. For those who have never taken such an embodied leap of faith, for those who don't believe it's sacred or even possible to prove the malleability of corporeal gender and perpetuity of spiritual wholeness, fear is an understandable response. As trans people, we hold a beautiful prophecy for the world. Over the edge of the unknown, deep in abyssal fear, the wings of divine Love are just waiting to scoop up all up, deliver us from the giants of oppression and discrimination, and transform our hearts and our communities. As we humbly aim the smooth stones of living our truth in each moment, we are already victorious in our battle to reveal God's exuberant grace to the 77th General Convention and to all who encounter us in our daily lives.